Outdoor kitchen ideas. Visit several beautiful backyards with designer/contractor Scott Cohen to see where the kitchen was placed and why. Get design ideas here. 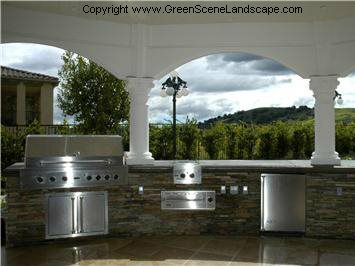 Take advantage of these five tips for choosing the location of an outdoor kitchen. Wherever you plan to grill or entertain should be strategically placed. Overlooking this important step can take the fun and convenience out of your outdoor environment. Views: It is crucial to consider views and sight lines when choosing placement for the counters. House window and door views from rooms that face the rear yard. Privacy from neighbors: Screen views with trees, hedges and shrubbery to provide privacy while respecting your neighbors. Wind: Smoke blows downwind of the grill. Be a good neighbor and plan accordingly. Consider that smoke will blow downwind of prevailing (found most commonly or having the most power or effect in an area) wind location. Always place dining patios upwind of smoke when possible. Sun and Shade: Outdoor cooking often takes place during the day in hot summer months. 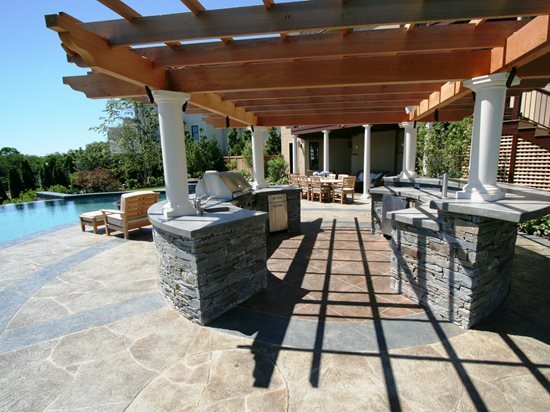 Place your outdoor kitchen under existing shade or plan on adding new sources of shade to provide comfort year-round. Natural shade from trees and vines is best because they ventilate easily. As an added bonus vines and trees "transpire," evaporate moisture to cool themselves, creating their own natural misting system. Shade trellis may be required, check local building codes, setbacks, homeowners associations, etc. Consider sun angles when placing shade bars. Use built-in umbrella stands to add shade options over your barbeque countertops. These inexpensive pre-fabricated pvc units work great for standard size umbrellas, but will not fit an oversize umbrella. They are often sold as volleyball net stands through any swimming pool supplier. Proximity to the house: Keep your outdoor kitchen close to the indoor kitchen to avoid long hikes to get more BBQ sauce. Keep it closer to the indoor kitchen – While grilling on the BBQ you will want to be able to monitor the cooking of the food. The further away the grill, the less likely you will have time to return inside to visit with guests and you'll end up staying out working the grill all by yourself. Typically food prep takes place indoors, so trips are required to grill outside. When the grill is a long hike from the indoor kitchen, return trips indoors to get more beer or BBQ sauce can create a disaster as you burn dinner. Access to Utilities: Gas and electric lines may play a part in choosing the ultimate location of your grilling center.